When we had our house inspected before we bought it, the inspector mentioned that the plumbing was a problem. He said the house had galvanized pipes, and I’m sure he explained to me why that was a problem, but to be honest I was in such a complete haze that day just from receiving one piece of bad news after another from him. So while I knew that galvanized pipes were a bad thing, and they’d need to be replaced eventually, I don’t think I knew just how serious the problem was. So obviously we needed to get a new hot water heater ASAP (the sellers actually gave us an allowance for a new hot water heater), and have it raised off the floor of the garage so that it would be in code. Now the strange thing about our hot water heater is the location. It’s located in the garage, but on the far side of the garage. See it in the right back corner? And see the door into the den on the left side? Yeah…it’s weird. So our plan all along was to just go ahead and have the hot water heater replaced in its current position, and then at a later date, create a utility room somewhere inside the house (more details on that soon! ), and have the hot water heater moved to the utility room at that time. That was the plan. Until Monday. The plumber and his assistant came on Monday to get everything hooked up for me, and I was fully expecting to have hot water by the end of the day. Well, I’m still without hot water. I wish I could have recorded my conversation with the plumber just so each of you could get a feel for the way he talks. He’s one of these people who doesn’t sugar-coat anything. He says everything in as few words as possible — very direct, very matter-of-fact, kind of loud and forceful, quick, and short. If his speaking were written musically, it would be played in staccato. I shook my head “yes”, thinking that he meant that they were going to have to turn the water off to the house to do their work. Then I’m sure I had a puzzled look on my face. Clearly he was trying to tell me something, but I wasn’t getting it. Then with his next sentence, I got it. Naturally, I was frustrated by the news, but still a bit confused as to why it seemed to be such a big issue. *Sigh* Okay, obviously that would mean more money. But if it had to be done (and I knew it did because the inspector had warned me), then it had to be done. We’d just have to bite the bullet and get it done sooner rather than later as planned. Oooookay, so let me back up here. I forgot to mention that while we do have a pier and beam house, it was evidently built by tree-dwelling elves of the Keebler variety who clearly forgot that one day, actual humans would have to get under the house. The inspector wouldn’t go under the house because he simply wouldn’t fit. The bug guy (i.e., the termite inspector) wouldn’t go under the house, because he wouldn’t fit either. And same with the plumber. Up to that point, there simply hadn’t been anyone who would actually fit under the house. So back to the conversation with the plumber. I swear to you, I thought I was going to explode. I wanted to punch him in the face as hard as I could for being so flippant about it. I could feel my face getting hot, and tears start to well up in my eyes. And then buyer’s remorse rushed in like a tsunami. It was all I could do to hold my tongue. So after waiting a few minutes (that actually felt like an eternity) as they searched for a flashlight, and then walked around the outside of the house looking through the vents into the crawl space, they finally came inside and into the bedroom closet where the scuttle hole is located. His assistant looked in, and said those six words that made the clouds part, and angels sing, and hope return to my heart. I stood there and watched him twist and turn and contort his body to get into that small scuttle hole, and then into the very shallow crawl space, and just about had a panic attack watching it. In fact, I had to leave the room. I couldn’t watch it any longer. But the good news….he fit! And he was able to get underneath the house everywhere he needed to go in order to do the work that needs to get done. My hardwood floors are safe!! Their lives have been spared! And I wanted to throw my arms around that assistant and give him the biggest hug and kiss he’s ever gotten in his life. So what should have cost around $1000 is now going to cost $2500. But that’s okay. I’ll have all new, updated plumbing, my hot water heater and washer/dryer hookups will be in the correct place, and I’ll still end up with beautifully refinished hardwood floors. While they were there, they did go ahead and remove the gas valves that were in each room. So now I’m left with just holes in the walls. That means I can now easily remove the baseboards that I’ll be replacing. And I’m also the proud owner of five vintage gas valves. 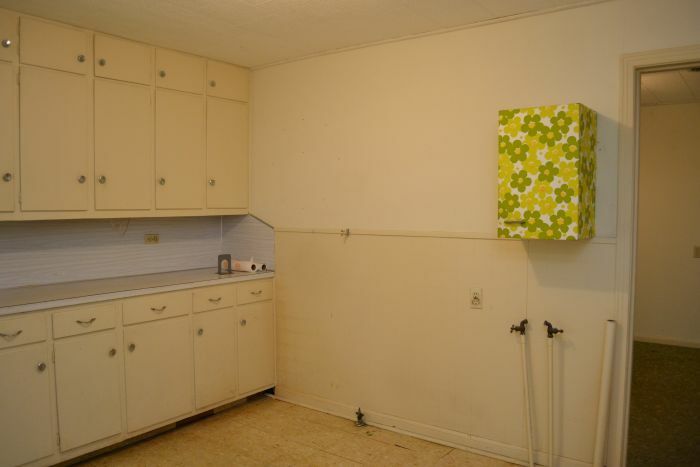 Oh, and remember how I had water pipes sticking up from the floor in the kitchen (presumably where a washer or portable dishwasher once stood)? Now I’m left with four holes in my kitchen floor, one of which is the perfect size for a rattlesnake (or any other kind of snake, for that matter) to crawl through. Yeah. That freaks me out a bit. But at least there’s progress, so that’s good. And one other bit of news. I started taking up the carpet in the den yesterday, and I found more asbestos tiles….plus, a big crack in the concrete. The crack wasn’t a surprise. I knew it was there. The asbestos tiles were a surprise. How do I know they’re asbestos? Because they’re 9″ x 9″ tiles. Those are definitely asbestos. Having these tested would be a waste of time and money. The good thing is that I don’t plan on removing these. I’ll just put plywood down (i.e., encapsulate them), and then put new flooring on top. Previous Post Hallway Closet...It's Outta There! Eeep! Thinking of that plumber squishing himself down under your house gives me the heebie jeebies!!! It’s a good job you had that cupboard to destroy for stress relief lol. But yay, floors and all new plumbing! I think that plumber is kinda cool. Because of his directness, you got to have the work done in no time and thank God to his assistant! Holy gorganzola cheese Batman… you got major cahones. Blessings to you in your labor of love. May the crawl space gods bestow favor upon your plumber’s assistant next week! I probably would have kissed the little plumber’s assistant. Hang in there. I look forward to seeing all the wonderful things you are going to do to your home. Oh Kristi … you have more self control than I would have had. I probably would have went off in a bad way! I am so glad that it all worked out in your favor! Good luck with all of renovations! Kristy – I am enjoying your adventure and just wanted to say that many years ago I bought an older house and lived through a lot of the same things (and more) but had the fun of having my Dad around to help me learn the DIY skills. Thanks so much for sharing all of the good AND the bad of your adventure!! 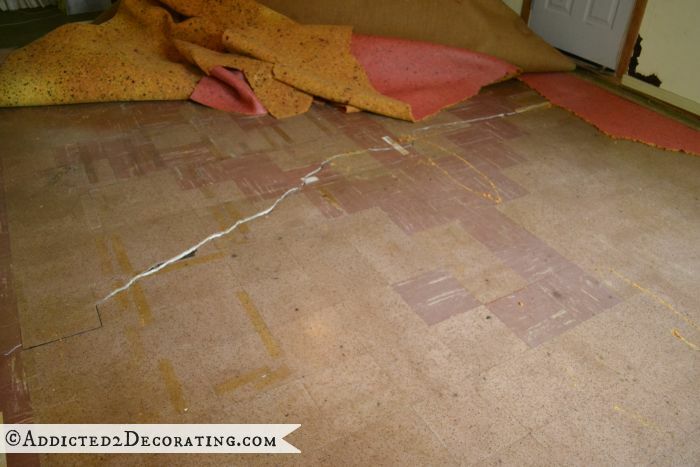 I did go eek when I thought they were going to tear up your floors….. I have lived in my 1960’s house now for 21 years and it is always something! You will have so many twist and turns it could make your head spin! But I know you will have the pride in knowing what a difference you will make to your home. P.S. when I saw those gas valve’s I was thinking…hope she keeps those to do something with later. Oh Kristi, I feel bad for you having to experience this just days after buying your house but in the future you will be happy that these things got done sooner than later. What if you had refinished your floors and then the pipes completely corroded and then you had to cut the floors all up. I ate when guys talk to me like that. There are better ways of delivering bad news. I am happy that you shared this story and I found it entertaining. Especially the part about the plumber speaking in “staccato” I totally got what your were trying to convey. I see a vintage gas valve coat hook rack in your future! What a journey for you, cant wait to see what you do with this place! I literally gasped when you said that they were going to cut holes in all of your beautiful hardwood floors! Glad they don’t have to! I would use the old gas valves as towel hooks. Can’t wait to see what you do with those valves! I’m sorry you’re having such a hard time. I know how you feel. My old house was the same way. It will get better! And for Pete’s sake, please stuff something in those holes! I’m terrified of what might come through them! I very strongly suggest that if there’s any way possible, buy a tankless hot water heater. I promise that you’ll be glad that you did. They last longer, produce more hot water than any tank heater can- instantly, and it is much easier to service/replace. Plus it will save you money on your utility bill (electric or gas). I wish I had, I really do. If I ever get to build a house, tankless, here I come! I live in a newer home, we have two water heaters in the attic. Ever come back from a wonderful weekend away and find your garage has a substantial amount of water on the floor – and it’s coming from sheetrocked walls? If I can get them in another home, then I’ll go the extra expense of having them installed in all baths, kitchen, and utility room. They’re pretty small units, and I believe it would be worth it in the longrun. I can sing the praises of a tankless water heater. We had a 80 gallon hot water tank and replaced it (2006) with a Powerstream Pro tankless. WE have NEVER ran out of hot water since. This is including when our daughter (that takes 30 minute hot showers) and her 3 kids (under 5 years old- lots of laundry) were on an extended (2 years) stay with us. We have an all electric system with geo thermal for heat and air. I do believe they make gas tankless also. If you had your gas hookups taken out and thinking about getting another heat system- some of the heat pump systems can also heat your water. Next best thing it does not have to keep reheating water all the time like in a tank -no water to leak out the bottom . It is a box that hangs on the wall- ours is about 14×20 and sticks out about 4 inches. The cost was very compareable to tank type, now no gas bill and our electric bill went down too (we had gas tank but electric pumps). And you get a tax credit on the energy bill. Most definitely worth checking into. I was just wondering if you were planning on replacing your water heater with the old standard water heater or the new ones that are about the size of a suitcase and heat the water as you use it? I am thinking that when its time to replace ours I am going to get the new style.. Our water heater is in our basement and our 2nd bathroom is on the other side of the house on the first floor and it just takes to long to get hot water that far and then your left with a short time frame of hot water… Sorry I can’t remember what the dang things are called? Do you mean a tankless water heater? We’re not planning on that for now. We’re just going to go with a regular 50-gallon tank water heater. But we might upgrade in a few years, especially when we tackle the master bathroom remodel. I’d like it to have its own water heater, and a tankless would definitely be a great option. The plumber’s assistant should be rewarded somehow once the job is done. My husband crawled under our 105 year old house to add insulation under the floors. He’s a small/slim guy and it was one of the worst projects he’s ever done. It’s claustrophobic, dirty, nasty, filled with spiders and I think he even found a dead cat. A special thank you gift of some kind is in order. I’m so glad your floors have been spared. What a blessing! Oh, and I second the suggestion about the tankless water heater. Hot water on demand and cheaper utility bills. Oh, Kristi… I am just reading every word of this and feeling- excited for you, but also kind of cringing at all of the bad things that come up. I wish you well, for sure, and thank you for posting all of the nitty-gritty details. 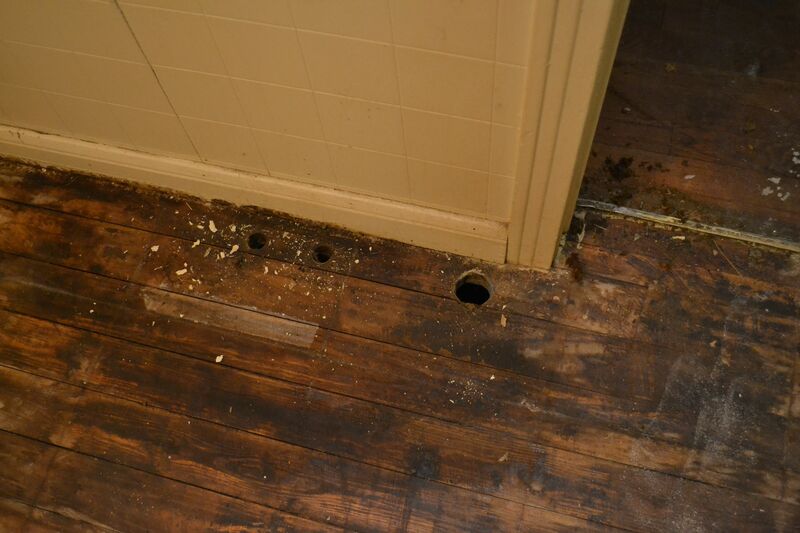 Our 1915 Craftsman bungalow had holes in the wooden floor from pipes that had been removed. We found these while pulling up the old vinyl flooring. Since they were in the middle of the room, we had to decide to replace all the boards, which were kind of a weird size, or get creative. We got hold of a sheet of old copper, cut it into the right size pieces to cover the holes, and crimped the edges under to make them smooth. Tacked them down with little brass nails. Now, it did not make for a perfect wooden floor for some people, but we loved that it added to our home’s story. stuff the holes full of steel wool. That might help keep the critters out for the time being. Great post ! Kristi – you are just precious!! And talented.. but you already knew that. I would definitely look into the tankless water heaters. When I was looking about 5 years ago our contractor said not to get one because the opening (of a hose or spout or something?) was so small that it really reduced the amount of water coming out of the faucet. Maybe they have changed or updated them? Kristi – you crack me up! I love to read your posts! Not only for the knowledge and insight of DIY projects but also because I love your humor and the way you look at things! Eeek! I’m glad they didn’t have to cut into your floors!!!! Luckily that guy was able to fit in the crawl space. Luckily, we have a walk-in crawl space. My Hubs used to do work where he had to constantly go into people’s crawl spaces – sometimes he would have to tummy crawl. Ah! I do have a question though – isn’t it better (for sake of anything going wrong) that the water heater be left in the garage and not brought into the house?? What if leaks or busts or something like that?! Wouldn’t you rather have that in the garage than in the house?! I’d rather have it in the house, BUT they are going to put a pan under it in case of leaks. Since it’s a gas water heater, if it’s in the garage, I wouldn’t be able to use any flammable products in the garage, such as oil-based paint, stain, varnish, polyurethane, etc. (That’s how my grandparents’ house caught on fire, and my grandmother had severe burns over 60% of her body. They didn’t think she’d survive.) 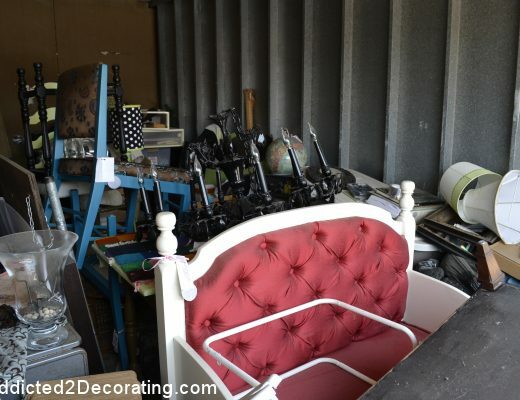 And since I want half of the garage to be my workroom, that would be a major inconvenience for me. So I’d rather have it out of the garage so I can be free to use my paints and stains as I need to. Oh okay, well that definitely makes sense! Our washer and dryer are on the second floor and we have a pan under our washer. It’s definitely convenient to have it on the second floor since that’s where all of the rooms are and I don’t have to worry about carrying stuff up and down the stairs, but I do know some people prefer it on the ground floor. I’m so sorry to hear about your grandparents’ house! And I sure hope your grandmother is okay. Those smaller holes look like a cross section of 1″ dowel will fill them. Just make sure that the dowel is a little bigger than the hole and hammer them in. Then stain them to match the floor. I did that with old cable and phone cord holes, and an unknown larger one. They look okay, and since they are so close to the wall, you will probably put a piece of furniture over the. I also second the tankless water heater. I wish I had put one in. I have a huge clawfoot tub and I can’t fill it completely with my new electric water heater (and I live alone). Just to clarify…my tankless water heater is attached to the outside of my very small house…it is NOT in the detached garage down the driveway. In case you might think THAT is why I have to wait for hot water. Nope!! I have to wait at least that long to get hot water from the tank, in the attic, to the kitchen or powder room on the first floor. IMO, waiting isn’t a biggie… unless I’m waiting for a tankful to heat, up after someone used it all, and I’m in a soon to be too cool bubble bath. Being used to instant hot water, we were surprised how long it too for the hot water to reach our shower, but we have a soaking tub and it never runs out and our bills are less. But another warning is there is a mystery plug of cold water that shoots through a minute or so after it first gets hot. We’ve learned not to jump in the second the hot water appears. Kristi~Reading your post brought back so many memories..We too bought an old house..It was a foreclosure and was bought as is…So many times l’d wished l could turn back the clock and buy something else..Hang in there, we finished and you will too. It’s so worth it in the end! It’s a delight to get to follow your rehab. We did a ’50s house years ago. It was wonderful and terrible all at the same time. Your final result will be a wonderful place to live your life! Basic maintenance and structural repairs should always come first. You need a firm foundation to build upon. I applaud you for bringing this home back to life. Enjoy the process! I know your readers are definitely finding inspiration already. So sorry for your bad news but it will be good news in the end. Much better to have it all done now so you don’t have to worry about it in the future. A word of caution, though, about connections in the wall (shower, etc.) My house was re-plumbed in December 2011 but the plumber did not replace the shower valve when he connected the pex pipes to it. Last week the hot water connection to the shower inside the wall spewew water inside. Very stressful. Fortunately, I had decided not to go out of town for a week for a wedding! So now I have a new shower valve, an open wall, and the plumber is coming back next week to install shutoff valves in the crawl space for that shower and for the tub in the other bathroom. That way, if it happens again, I can still have water in the rest of the house. wow, wow, wow is all I can say. You are so funny in telling your stories. I was afraid that guy would get stuck under your house!! Glad the plumbing is working out for you in the end. I was so afraid he was stuck under there! Come to think of it, it wasn’t when he was getting into the scuttle hole that I had to leave. He went in there just to test it out to see if he would fit. He got in okay (although it did take lots of twisting and turning), but it was when he was trying to get out that I couldn’t stand to watch. He had quite a bit of trouble getting out, and the more I watched him struggle, the more I felt like the room was closing in on me. In fact, even that night as I was in bed trying to sleep, I would doze off and start dreaming that it was ME in that hole trying to get out, and I was stuck!!! I think I woke up in a panic about three times. No joke. Check with your gas/electric company. We have a rental property in Aabama & the power company had a program where they would give you the hot water heater if your old one was not up to code. It was a few years (5ish) ago & I “think” it was a push for energy efficient reasons. You are on your way & I’m having a blast following you antics! 🙂 Go Girl! I think they’re called “little people” now, and believe you me, I would have insisted that he find a little person who happens to be a plumber before I let him cut into my floor!! Oh, Kristi, I actually stopped long enough to pray to God, thanking him for his blessings on you before I took time to respond. How I love reading your blog. You are super descriptive, and have a way of surmounting every obstacle. My heart sank at the words “buyers remorse” because I was afraid you would give up. I am going through a very similar problem with our plumbing. Something happened that caused water to stand a foot deep under our house. After using a sump pump every day to remove it over and over, we got a plumber out and he found that the galvanized plumbing (1969) had burst under the concrete floor of our utility room where it should have gone into the water tank. It goes underground from the submersible pump, up through the concrete in the utility room and into a water tank. Then goes back under the concrete across the utility room, and in the crawl space to the rest of the house. The plumber made an emergency repair for now. Burst out the concrete and replaced the burst galvanized pipe and left the concrete open. As soon as he can fit it into his schedule, he will return and re-plumb the entire house. I’m sure our water heater is full of sediment, too. We are scheduled to get city water next spring. We are really looking forward to getting rid of all our galvanized plumbing. We also have one bathroom on the far end of the house away from the water heat. That uses way too much electricity. Not only do you have to wait for the hot water to run through all that plumbing, but then you leave hot water in all that plumbing that will get cold and be wasted. We will buy two tankless water heaters, one in the utility room for the rest of the house and another for that bathroom located far away. 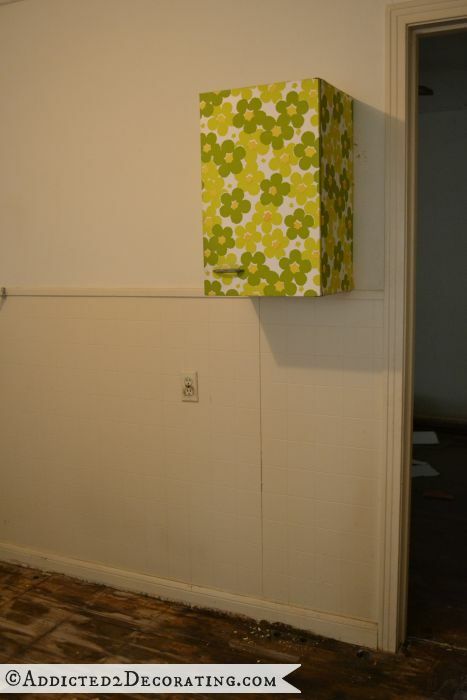 It will be small enough to fit under the sink, or on top of the return air duct that is in the linen closet. Like someone has already said, pack those holes in the floor with steel wool until you can replace that board. Rats and snakes cannot stand the steel wool sticking into their skin. Love your adventure and keep the faith. The only other possible problem you need to get checked out is whether or not you need to replace the wiring. You’d hate to get all that work done and have the house burn from faulty wiring. That will bring your house up to code and make it perfectly safe. You’re going to have such a jewel when you get it completed, and you’ll never want to move because you have done everything the house is asking for. Suggestion for vintage gas valves: After cleaning them as much as possible, frame them in a shadowbox frame and hang them in your new utility room once it’s finished. Oh my, what a plumbing nightmare you’ve had to endure!! So sorry to hear about that. It makes my plumbing issues sound like a cake walk! Kristi, like many others, I read your blog as soon as I see a new posting. I am enthralled with your adventures/challenges and how you surmount them. Photos are nice, yes, but your writing is interesting all of the time and funny often. Second – As I was reading this story I kept seeing dollar signs in my eyes followed by at least 5 figures, which is what it could cost to replace all the plumbing pipes in a house that size up here in Seattle. But of course, your house would have cost about 10 times what yours did if it were in Seattle also. $2500 to replumb an entire house?? Unheard of! I agree that this is a blessing in disguise – one of your biggest headaches will be gone and you won’t have to worry about it later. Sorry about the plumber 🙁 I would have killed him right then and there. Oh, and I might have to steal your “red, hot, fiery, flaming darts from the deepest pit of hell to shoot from my eyes…” line. PERFECT! I suspect you and/or your mom might be good bakers. Maybe you can make the plumber’s assistant a Texas-sized cake since the hug and kiss would have been awkward. It will only get better, Kristi! Congrates on your plumbing conquest. However, have you checked the electrical yet. 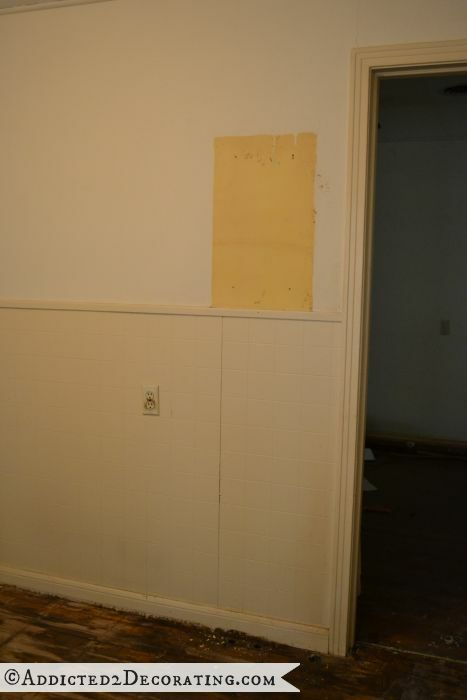 From one of thepicture you posted, did you see the black markings around one of the outlets in the kitchen? I dont want to be the bearer of possible bad news. But we recently moved in to a 30 year old home and we had similar electrical issues.Better safe than sorry especially in the kitchen where there is much water and electrical outlets. Hope I am wrong. I’m almost certain that what you saw was just years of dirt and grime build-up, but I’ll make a point of checking next time I go over to the house. 🙂 I did ask the inspector specifically about the electrical wiring, and he said from what he saw, everything looked good. I asked specifically about aluminum wiring also (because I’ve heard that’s what can really cause problems and start fires). He said that aluminum was used in the late 60s and early 70s when copper became too expensive, so that was well after my house was built. But with that said, I do want to have an electrician out soon just to look over everything. Love your posts. Always read as quickly as they arrive. We did an old house one time and had si nuch fun. The entire small town where we lived thought we were crazy but the end results was well worth the effort. Still my favorite house of all time even though I didn’t get to live in it for very long. The only house my late husband and I ever sold that we cried about as the movers were putting the last of our stuff in the moving van. The floorman used corks (as from a wine bottle) or Hobby Lobby to fill in the holes left by removal of pipes. They blended in with the floor once stained as well as closing up the holes. I am truly enjoying your adventures and look forward to all your posts. I hear you Kristi. The other day when I had a gas leak (after everything else I had endured) I thought “why did I buy this house”? But the next day that feeling was gone. It just takes longer and costs more than any of us think it will but again the end will be so glorious!! I had to have quite a bit of re-wiring done because I had no GCFI outlets in the entire house. When my hot water heater goes I am all for tankless but it is one of the newer things so it will be quite a while which is fine with all the other money that I feel like I am hemorrhaging. But again it will be done my way to my taste as will yours! Few pics no problem. Kristie, you are amazing and have so much resilience to take all this on. It is way more than a little renovation. You should be very proud of yourself and I am sure we will eventually see a whole house reveal that is beautiful and charming! 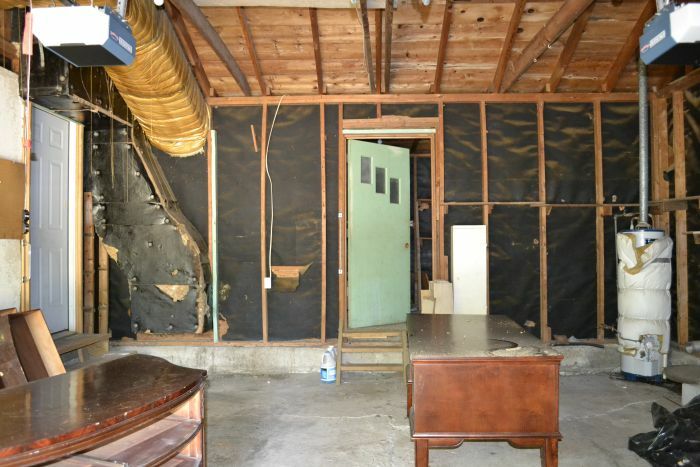 I love reading your posts because you are so honest about the frustrations of deal with old house major renovation! Wow! Such a busy day and your plumber cracks me up. Love his directness but am sorry you have to spend more $$$ than you wanted to. At least everything will be new and working well. Thank God for the assistant and his willingness to go into that crawl space and replace the pipes. As for those holes in the floor, fill them with steel wool and then seal them with wood putty. Should keep the critters out. Your removed that ‘groovy’ cabinet? Now that’s a 70’s collector item if I’ve ever seen one. LOL Hang in there and take it one day at a time. Old houses can be full of ‘trouble’ but usually worth the angst in the end. Wait..wait..give me a minute! I laughed so hard while reading your post that tears were streaming down my face! I thought for sure my husband would come out of his man cave to check on why I was laughing so hard. I just love your posts, Kristi. I look for them everyday and follow your projects. I know its alot of hard work but really….you are an inspiration to many with all the things you do. I’m glad everything is going to be ok with the plumbing and that the work WILL get done! Whew!! And, you’ll still have your beautiful floors that mean so much to you. Thanks for posting details and keeping us informed with your projects/repairs! Please check into the tankless water heater option and give us your assessment – I’ve always wanted one. I was having a panic attack just reading about the plumber’s assistant crawling under the house!! And I was thinking exactly what you wrote…thank you for taking the cabinet down…bless your heart! 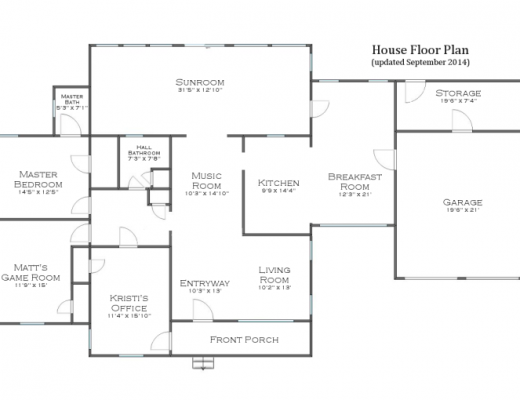 Very happy your floors were saved…wow! Wow, what a day you had. Glad it all worked out! Hey Kristi…I am So glad that i found your blog. I am 56 and recently separated and living in an apartment which I am trying to decorate without breaking the bank. 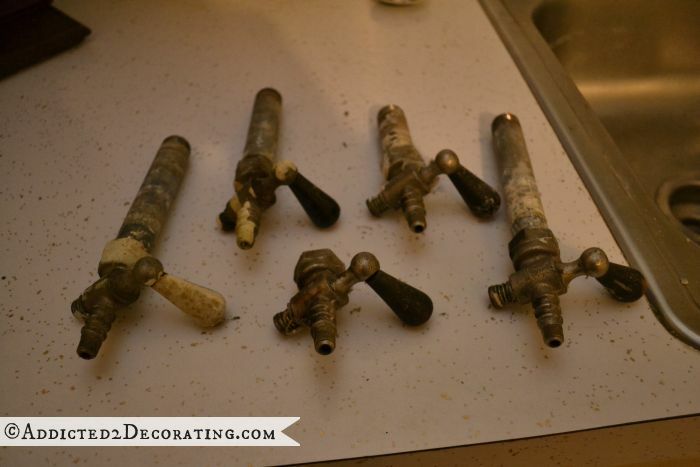 Your blog has inspired me to get back to the girl I once was…the one who painted and papered her own walls, installed faucets, and wasn’t concerned with attempting to do it herself. One accent wall painted, my next project is replacing the ugly fabric on the back of two chairs I bought at home goods. I am in the process of removing the nail heads and will then use the wonderful new fabric I found (1 yard needed) and have beautiful new accent dining chairs. And I would never have been inspired if not for you! SO thanks!!!!! I’m so glad you’ve been inspired!!! Sounds like you’ve got some great projects lined up. I hope you got a great, great deal on the house! Isn’t that info required under seller’s disclosure? Even if it had been, I’d think the sellers would have given you discount for that also. Sorry! Good news though, it can be fixed! I’m soooo excited to see what you do with house! It was all disclosed and revealed with the inspection. Well, except for the asbestos tiles under the carpet in the den. But I don’t think anyone had a way of knowing about those since they were hidden under carpet. Whoa! That sounds like an amazing deal… even with the asbestos! Would never find something like that in Canada. Yikes that big crack looks like a bit of a worry. Is the den off the garage with same concrete floor? Cheers from confused in Brisbane. Yeah, the crack looks a bit worrisome, but I’m really not concerned. The crack has been there since the 70s. It looks like they poured the concrete without using rebar, and when you do that, it’s bound to crack. I plan on using a self-leveling concrete to repair the floor in that room, as well as the garage floor. The inspector and the foundation guy both didn’t seem to think those were too big of a deal, especially since the rest of the house (with the pier and beam foundation) looked in good shape. I HAD to keep reading, this was like a mystery novella. At one point, I was actually holding my breathe wondering what the plumber was going to say again. Our original house was built in 1947 so I know what you are going through. I could even save a few doorknobs for you. But at least we fixed ours a little at a time. Put some steel wool into the holes in the kitchen. Bats, mice, etc. will not gnaw on it. I still can’t believe everything that you have already done. You’re amazing – I guess the adrenaline is still rushing! Read. Every. Word. I must admit that the thought of going into a dark, cramped place that I had to struggle to get into makes my head pound. My husband got me to watch a horror movie that took place in a bunch of caves and we had to turn it off because the closed in spaces were freaking me out. I am SUCH a weirdo. Can’t help it. (Don’t want to.) You make so much progress every day that I am amazed! Go girlie! Love this post-I felt like I was there with you through the entire ordeal, I swear my pulse quickened when I read the plumber wanted to cut holes in the floors! Sorry about the unexpected expense but glad that skinny plumbing assistant can fit under the house! Small Blessings! So glad the floors were spared! I know how devastated you would have felt. When I read that you had the valves removed I thought, “Noooo!” But that you’ll keep them and do something with them (too cumbersome for a peg rack? ), that’s great. You’ll come up with the perfect idea; the plumber is wrong about the drawer! Our home has several old gas valves, at about chest height, from gas lamps I suppose. People ask us about them all the time, as they’re so unusual. They are covered in layers of paint, but I’m planning a wintertime project of removing the paint to see if they’re lovely and decorative beneath. Oh, and Kristi, for goodness sake, don’t worry about whether your posts are all over the place or coherent. We’re all astounded you have any energy left to post at all after a day of your level of activity and are privileged to be invited along for the ride. FYI, don’t ever let a plumber or electrician tell you he has to RUIN your hardwood floors by cutting access holes. THEY would ruin it, because they aren’t flooring people. They would simply take a circular saw and cut a big hole. 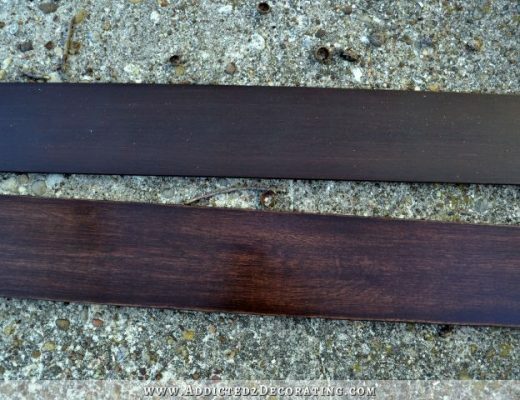 But it is possible (and not terribly difficult) to remove individual hardwood planks intact and then re-install them. 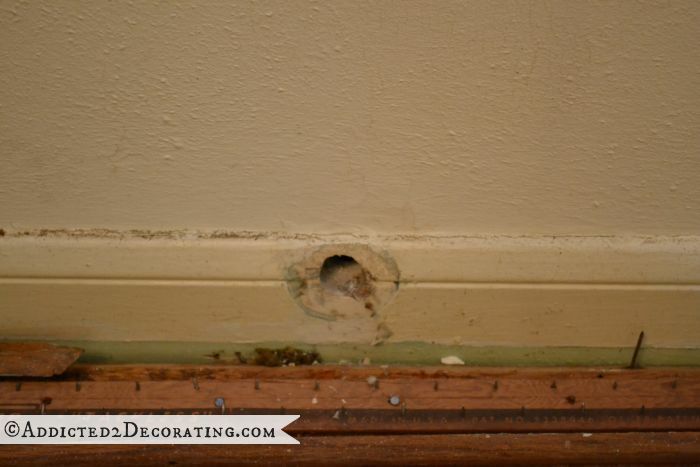 The plumber (or whoever) can get their access hole, and you can keep your beautiful floors. If you don’t want to try it yourself, have a professional hardwood flooring installer do it. The money you will pay him is well worth it when you consider the alternative! Ok, yesterday I said I was with you all the way on this new house progress…..
Today, I felt the stress was going to kill me while reading this post! Yeeks! I feel like I need a shot of whiskey or something! Go tankless! I find mine amazingly efficient. I just paid $30 for four months worth of propane to provide hot water to my house for everything (laundry, cooking, me) for four months. Based on my prior experience in a rented condo with a new efficient tank hot water heater, I save about $390 per year with the tankless. That’s about four years to recover the cost in a new home. Mine is fairly close to the kitchen, bath, utility room, so I get hot water pretty quickly. In fact much more quickly that I did in the condo where the hot water heater was all the way across the building and the water had to travel underneath a concrete slab. My tankless is in the crawlspace, vents outside, and I am on a well, which seems to make no difference whatsoever. God bless the smaller plumber. He’s the hero this week. Galvanized pipes rust from the inside to the outside, a process that takes about 40 years. Good riddance to them. You continue to amaze me! Keep up the fabulous work. PS I have a gas dryer and a gas hot water heater and love them both. Wow is all I can say about your project for renovating your new -old home. Your plumber woes were frightening but thankfully resolved. I am just now renovating a semi detached I have owned as a rental investment for 25 years. Yep got the mortgage paid off and decided to sell ( for my retirement fund) but some renovations first as there is a demand for move in ready. Well forget that. Should have sold it as is were is. We ran into dry rot on one 2 story wall and ended up with a contractor fixing that and residing the end wall . That was an 8,000 dollar investment . Well this house is going to look mighty fine with new bathrooms , kitchen and wood floors. Just keep your fingers crossed for me that we can at least recoup our original renovation projected expenses. Oh my goodness, so sorry you had to put so much money into that! I hope you can get it back when you sell! My dear, what you go through each day. Ahem. I have been there, and yes, to hug he small dude would have been awkward. Good call on that. its all going to turn out ok, you know this, right? Because it will. Hang in there. I vote for gas water heater. It will be fine, cost less and be less stressful. Keep your sights on the big picture! Glad to read they did not have to cut into the wonderful wood floors!!! Waiting on pins and needles to see what you do next! Kristi, after researching tankless water heaters on Consumer Products, I have done a complete turn around. We don’t have a gas line in our community, not would I want one. Consumer Reports research found that it does not actually save money because of the high costs of buying and especially installing, it takes 22 years for the tankless water heater to recover the difference, but they are only rated for 20 years of use. Electric tankless water heaters apparrantly are unreliable. And a point of use tankless water heater is for one sink only, not a whole bathroom. So we will continue with an electric tank water heater. Kristi, you are one brave soul. I love that your sense of humor shines through even the craziest of days. And I really, really look forward to seeing what you plan to do with those vintage gas valves! 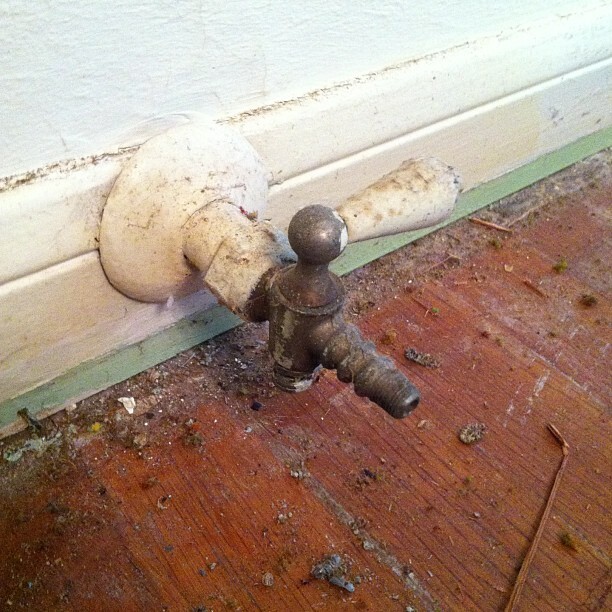 When I was a kid the house my family lived in had to have the plumbing all redone. We had a concrete floor though so to get to the pipes they would have had to break through the floors AND the concrete! My dad rerouted all the pipes up through the attic on his own instead. Its an idea for you…. Omgosh Kristi, you crack me up! I just spit coffee all over my lap…lolol great work, love your blog!